In spring 2012, began discussion about the idea of establishing a free and open-access academic journal, dedicated primarily to the history and archaeology of the Balkan Peninsula, but also covering a broad range of connected interdisciplinary fields of study. In order to make sure that the time was ripe for this kind of academic publication – intended to bring together fellow academics from the Balkan countries, and also all researchers of Balkan matters past and present – the founders began contacting colleagues and collaborators through a wide array of both social and professional networks. Although the founders expected a slow climb, as HAEMUS was, in a sense, starting from scratch, the response was overwhelming. Numerous scholars from all Balkan countries, as well as a great number of academics worldwide, have not only unanimously greeted the initiative, but also offered significant advice and pro-bono collaboration. In a very short time, a Board of Editors and a Board of Reviewers were established, comprising of scholars from a number of different affiliations to Universities and Research Institutes worldwide. Thus emerged a compact, but significant and organised network of fellow scholars committed to creating a difference in the field of Balkan historiography, archaeology and humanities in general, embracing high scholarly standards and community relevance. 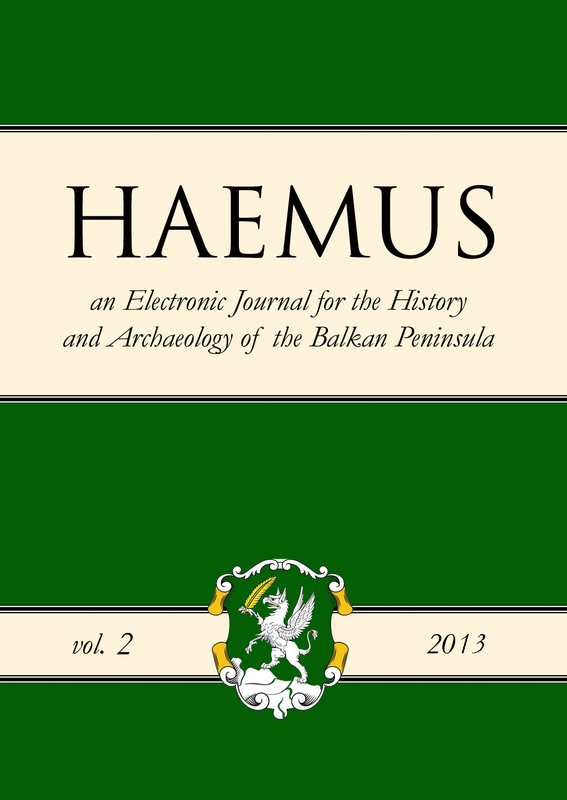 Respecting the different backgrounds and interests of all our colleagues, as well as being inherently committed to interdisciplinary scholarship, HAEMUS publishes articles dealing with issues and challenges in the fields of history and archaeology, but also archival science, public history, historic preservation, cultural heritage, museum studies, web–based history, memory studies, and other related areas. Therefore, the Boards of the journal include historians, archaeologists, archivists, curators, art historians, public historians, educators, and librarians. The title HAEMUS, covering the territory of the entire Peninsula throughout different historical periods and impartial to modern national concepts, was chosen to illustrate a lack of encumbrance with the modern historiographical burden of nation-states, ethnicity, politics and other non-academic agendas. The content of the journal is based on pure academic research and conforms to the highest standards of professional research and publishing. “Since the 17th century, with advances in printing technology, print journals have played a pivotal role in the creation and dissemination of new knowledge. Four centuries later, these journals continue to be the primary means for communicating research. But changes are in the air, as the Internet, and the World Wide Web in particular, alter the ways that scientists communicate and interact with each other, as well as with non-scientists, transforming the process by which scientific information is disseminated, collected, used, and archived, and compressing both time and distance in ways previously unimaginable. Even what constitutes “publication” in science will continue to require rethinking in the face of emerging information technologies. HAEMUS endorses and intends to promote those exact principles.